Released as a five disc box set and limited to 9,999 copies worldwide, Subversive Cinema’s Dust Devil – The Final Cut sets a standard for future genre releases. Alongside a beautiful transfer of the director’s cut, Subversive Cinema has also included a “Work Print” version of the film (with all the deleted scenes edited in), three of Richard Stanley’s previously unavailable documentaries (The Voices of the Moon, 1990; The White Darkness, 2002; and The Secret Glory, 2001) and Simon Boswell’s original Dust Devil soundtrack on a separate CD. These are supported by three full-colour booklets: Stanley’s Dust Devil Production Diaries; a collection of essays in which Stanley discusses his documentary practice; and a short original graphic novel that explains the Dust Devil’s past. As if this were not enough, each of these extra discs contains a commentary by Stanley with other relevant information such as production biographies and related trailers. Given the intellectual content of this considered package, one cannot help but interpret this release as an attempt to provide not just an extensive context for a specific film but also an equally extensive portrait of its director and his increasingly singular vision. For Stanley, Dust Devil has been a twenty-year project. What initially began as a student film (the remaining footage of which is included on the first disc) has developed into a film that is now nearly as mythic as its title character. Repeatedly dogged with production problems, daily rewrites and a steadily dwindling budget, Dust Devil is a film that almost defies classification. So heavily immersed in cultural myths – from the vanishing hitchhiker to the Nagtloper and the Dust Devil itself – the film seems to be of the serial killer sub genre, but one that shifts back and forth into the imagery and climatic confrontations typical of a Western. 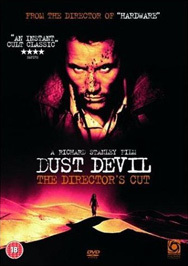 Perhaps Dust Devil is best described in these terms, as a mutating hybrid in which Stanley has mixed together his personal obsessions, favoured cultural icons and taste for exquisite imagery into a film of dramatic and beautiful consequence. Because of this generic mix, the narrative itself seems deceptively simple. Set against the vast expanse of the Namibia Desert, a series of ritualistic murders are taking place in and around the drought-stricken town of Bethany. Ben (Zakes Mokae), the local police officer, slowly realises these murder are being committed by a mythical demon, the Dust Devil (Robert John Burke). Paralleling Ben’s investigation is the arrival of Wendy (Chelsea Field), who is running away from her abusive husband. Whilst driving towards Bethany, she picks up a hitchhiker, unaware that he is the Dust Devil. As they travel together, a peculiar attraction develops that is inextricably leading towards Wendy’s possible murder. What transforms this seemingly clichéd serial killer narrative is the imagery itself. Imbued with cultural references and magick symbolism, Dust Devil functions as a brooding mediation on the idea that Good and Evil has vanished from the material world, and left in its place the ambiguous notion of Spirit and Matter. Given this, Stanley’s film is replete with a diverse range of symbols and motifs: the spiral is the predominate image, either appearing physically within the film itself or within the repeated spiral movement of the camera. The narrative itself attempts to perform a spiral in which the three main characters are drawn inextricably towards each other. There are multiple references to Spaghetti Westerns, with Boswell’s Ennio Morricone-influenced score clearly making the Dust Devil a truly demonic interpretation of Eastwood’s The Man with No Name. In addition, there are the repeated allusions to time: the Dust Devil constantly consults his pocket watch (in another reference to Sergio Leone), attempts to freeze instances of time by taking Polaroid photographs and, in one of films more graphic scenes, inserts a clock into the dismembered body of his first victim. Each of these symbols function as a representation of Spirit or Matter and their placement alongside each other allows Stanley to draw “together a variety of generic and cultural traditions in order to explore our fundamental need for a belief system in increasingly destructive times” (1). Given this, Stanley depicts a world in which magic (or religion) continues to thrive regardless of humanity’s separation from or denial of it. As such, Stanley’s characters are lost and each one – Wendy, Ben and the Dust Devil – are all searching for Spirit within the cold, mundane Matter of modern life. The intended references and conceptual integrity of these images is evident in the director’s commentary, where Stanley provides a complex explanation of specific images or scenes. These reflections are expansive, with Stanley making biographic connections (particularly in the scene involving the Dust Devil and the children at the shooting range), political associations or genre discussion. As a result of this, the Dust Devil commentary – like the other commentaries on the other discs – proves Stanley to be an intelligent, reflective and single-minded filmmaker. In additional to the critical commentary, Stanley also provides extensive explanations on the escalating production problems. These incidents (such as the theft of a prop which later turns up with its cutting edge smeared with congealed blood and a body buried behind the production bunker) escalate to the extent that Stanley’s film would appear cursed. As broad and as intriguing as these commentaries are, they do, to a certain extent, undermine the inclusion of the two booklets: Stanley’s visual analysis and production anecdotes are repeated with small additional expansions, again giving credence that this release is as much about Stanley and his approach to filmmaking as the film itself. Of the more bizarre comments included in the Production Diaries is the fact that on the 15 August 1991 Stanley was forced to sign a contract wavering his legal rights to injunct the film’s release or remove his name form the project. After protracted arguments, Stanley final signs the contract – in his own blood as a symbol of protest. Watching the documentaries alongside Dust Devil has the slightly negative effect of diluting some of the film’s mythic qualities. In The White Darkness and The Secret Glory, the very real presence of the mythic within culture is made evident and given an equally strong sense of realism through those who are involved within these practices. Regardless of this, all the three documentaries visually support the notion that Stanley clearly has auteur potential for each consolidates his visual and conceptual concerns. Within each documentary, the presence of Nature looms large, with each carefully composed and æsthetic image finding the sublime beauty and terror within the landscape. Each tract of land is visualised as a desolate and devoid space to the extent that they merely reflect those vast expanses of the Namibia Desert within Dust Devil: these are all mythic spaces in which contemporary society can connect back to its spiritual roots, if it so chooses. Or, to view it in Stanley’s bleaker terms of Spirit and Matter, these are merely physical spaces in which terrible events have and will continue to happen. 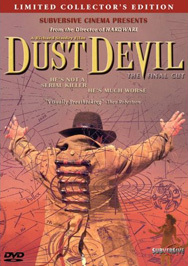 In comparison, Optimum Home Entertainment’s earlier Region 2 release of Dust Devil – The Director’s Cut is bound to pale in the light of Subversive Cinema’s quality package. Even so, this release features an exclusive Region 2 commentary by Stanley that is another complex combination of biographical comments, production anecdotes, political reflection and explanations of the symbolic value of certain scenes. Four of the deleted scenes that have been integrated into the Work Print disc of the Region 1 release are included here as separate clips. Taken out of the context of the narrative, these scenes – the supernatural intervention with telecommunication devices, a train pulling into Bethany Station and Ben’s dying vision of his wife and son – are drained of their potential dramatic value: the Dust Devil’s interference with telephones and telegraph wires appear here as a horror cliché, but when viewed within the context of the Work Print these scenes amplify the isolated nature of the characters as much as defining the slow spiral drawing of Ben to the Dust Devil and the Dust Devil to Wendy. Also, Ben’s dying vision provides the only positive moment within Stanley’s bleak narrative conclusion, for his murder finally frees him of his guilt and is potentially spiritually reunited with his family. With this scene included, the potential ambiguity of Dust Devil is implied; perhaps for some people an end to the suffering is better than its endurance. To conclude, and perhaps just for completion purposes, prior to both of these releases the German-based company Laser Paradise released a Region 2 disc of Stanley’s Final Cut. In addition to the German trailer, there is a short, poor-quality documentary of the making of the film, with Stanley again commenting on the production problems and subtly hinting at the biographic possibilities of the film. Having not viewed the disc, it is not possible to be sure but one can assume this footage is, more than likely, the same as the on-location documentary included on the recent Subversive Cinema release. James Rose, “The Light and the Darkness: Myth in the Films of Richard Stanley”, Senses of Cinema, no. 32, Jul-Sept 2004. Accessed at Senses of Cinema, 16 November 2005.